Each of our cakes are 4 layers with 3 layers of delicious filling! With over 50 flavors to choose from, you can create the perfect dessert for your next special occasion! ​*Please note: Pricing listed below is for our traditional iced cakes (as pictured). There is a small up-charge for Gluten Free and Dairy Free products. 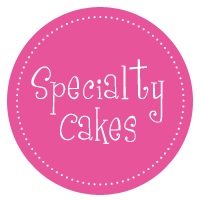 Please contact us for pricing on any decorated cakes! Please fill out your information below to place your order! Please note: Pick-Up is only available Monday - Saturday. Choose Flavor Almond Joy Banana Caramel Carrot Chocolate Chip Cookie Dough Chocolate Doubled Chocolate Hazelnut Chocolate Peanut Butter Chocolate Peppermint Chocolate Vanilla Cookies 'n' Cream Death By Chocolate Funfetti German Chocolate Hummingbird Italian Wedding Cake Lemon Marble Cake Milk 'n' Cookies Mint Chocolate Chip Nutella Oreo Peanut Butter Chocolate Chip Pumpkin Spice Red Velvet Salted Chocolate Caramel Snickerdoodle Strawberry Strawberry Cream Strawberry Lemonade Strawberry Marble Tuxedo Vanilla Chocolate Vanilla Cookie Dough Vanilla Doubled Wedding Cake Blueberry Lemon Cannoli Chocolate Covered Cherry Chocolate Covered Strawberry Chocolate Raspberry Coconut Key Lime Lemon Dream Lemon Raspberry Neapolitan Pineapple Raspberry Cream Strawberry Dream Strawberry Shortcake Tiramisu 7 Layer Vanilla Chocolate 8" 6 Layer Pecan Cake 8"
Note: This order is for ONE cake. If you would like more than one cake of the same exact flavor, please select your desired quantity below. If you would like to place another order with different flavor(s) and/or Sweets, please visit the Order Online page and submit a separate order form. Thank you!